Eighteen Films. One legend. 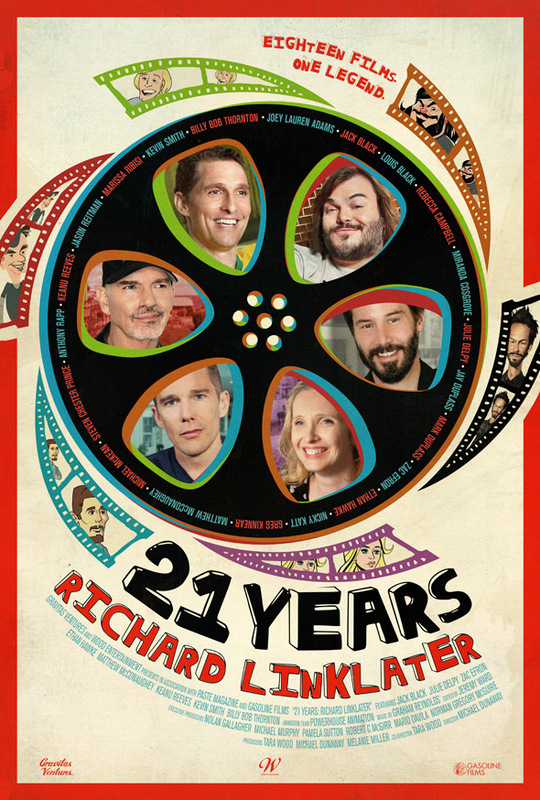 Gravitas Ventures has revealed poster art for their upcoming documentary 21 Years: Richard Linklater, telling the story of Linklater's filmmaker career so far. Co-directed by Michael Dunaway and Tara Wood, the doc features (some of these guys are seen on the poster) Zac Efron, Matthew McConaughey, Ethan Hawke, Billy Bob Thornton, Jack Black, Kevin Smith, Parker Posey and many others. It's already set to premiere in theaters and VOD starting this November, so there's not too much longer of a wait for this one. I'm looking forward to delving deeper into Linklater's fascinating and invigorating career. Description from publicity: "It's been said that the first 21 years defines the career of an artist. Few directors have single-handedly shaken up the film establishment like the godfather of indie, Richard Linklater. From the groundbreaking Slacker to his innovative Boyhood, Linklater has reached the 21-year mark and has unapologetically carved his signature into American pop culture." We first wrote about this doc earlier this summer, thankfully in theaters soon. "For a man who became famous for celebrating the cool and casual, Linklater emerges as a surprisingly strategic and visionary director who has already established a legacy and perfected a style that can't be denied." 21 Years: Richard Linklater hits theaters + VOD on November 7th. I hope they show Jack Black when he was in THE X-FILES.